An audience will watch 'bad' video so long as the audio is good but not the other way around. Audio that's hard to understand, full of background noise, too quiet or really inconsistent between soft and loud will make an audience swipe past your video faster than most visual issues. Why? Bad audio is annoying. Check that, it's REALLY annoying. If I can't understand what you're saying or there's too much distraction in the audio I can't follow along with what you're trying to tell me. I'm moving on to another video and will be suspect before trying another one of your videos. Microphones by their very nature try to pick up as much sound as possible. A microphone works the best when it is pointed directly at the source, in this case, that's you. If you're using a smartphone or mobile tablet there's no way to hold that device so that the camera and the microphone point at you at the same time because the microphones are built into the edges of the devices and the cameras onto the front and back. With the microphone pointed to the right (or down when holding it vertically) the microphone is concentrated on picking up all of the sound to your right or below you. Here's an overhead view of what I mean. My audiophile friends will say that drawing is not entirely accurate, but it shows you the basic idea of what the microphone is doing. It's pointed to the right and thus concentrated on the sound happening in that direction instead of you speaking to it. Your voice will be more of a background sound, much weaker and tinnier than normal while also competing with all the other noise around you. Even in the quiet of your own home, holding a device like this results in a weaker, more echo type of sound rather than good clean audio to listen to. The solution is to use a proper microphone that's concentrated on your voice, not the environment around you. Earbuds are the easiest solution. Either wired or wireless, these are designed to operate very close to your mouth ensuring that your voice is the strongest sound in the audio. Even with earbuds, you want to avoid overly windy places if at all possible. When the wind blows across the microphones, you get that hurricane, wind sound that will drown out what you're saying. Next up are shotgun microphones, so called because they sort of resemble a shotgun. These are great for mobile devices, digital cameras and GoPros. For a digital camera like a DSLR, they are plug and play. Just attach it to the top of your camera and connect it to the microphone input. For a smartphone, tablets and the GoPro, you'll need a frame like those from iOgrapher and Ulanzi to mount the microphone. For smart devices, you'll need the Rode audio adapter to allow the microphone to work correctly with your smartphone and tablet audio input. For the GoPro you'll want something like the Ulanzi GoPro Frame to mount the microphone and the GoPro USB Audio Adapter to attach the microphone to the GoPro. With the shotgun microphones try to keep the cameras about an arm's length away from you and keep that microphone pointed directly at you to get the best possible sound. Better shotgun microphones can be up to 10 feet away and still get good sound. My favorite shotgun today for digital video is the Shure VP83 LensHopper. A little more expensive than the Rode mics, but I find I can get good really good audio pickup even from 8 feet away. The only downside to a shotgun microphone is that when it is mounted on top of your camera, both the camera and the microphone have to be pointed directly at you to get the best possible sound. If you intend to move the camera around and show off your environment, such as a food or travel vlog, whenever you pan the camera away from you your audio will drop off. So if that's the case, stick to ear buds or the next category, lavalier and handheld microphones. Lavalier microphones are clipped directly to you and allow the most freedom to move about and move the camera around. Handheld mics, as the name implies, is a mic you hold, reporter style. Since the microphone is directly on you, the camera can point in any direction and you're still getting great sound. Lavaliers and handhelds come in wired, wireless and bluetooth formats. Wired microphones connect directly to your device. They are generally just plug and play, especially for digital cameras. If you purchase a microphone with a standard stereo connection and plan to use it with a mobile device, you'll need that Rode audio adapter I mentioned earlier. If the wired microphone is designed specifically for mobile devices you should be good to go. The advantage of a wired microphone is that you will generally not get any electrical interference from your surrounding environment. Wireless microphones are increasingly prone to electrical interference as the electronic spectrum is more closely governed and more channels are being opened up for emergency responders. The disadvantage is that you will be physically tethered to the camera or mobile device which could be limiting depending on the length of the cable and can also present a trip hazard to those around you. Be especially mindful of your surroundings when you're in a public place with a wired microphone to ensure you don't hurt yourself or someone around you. 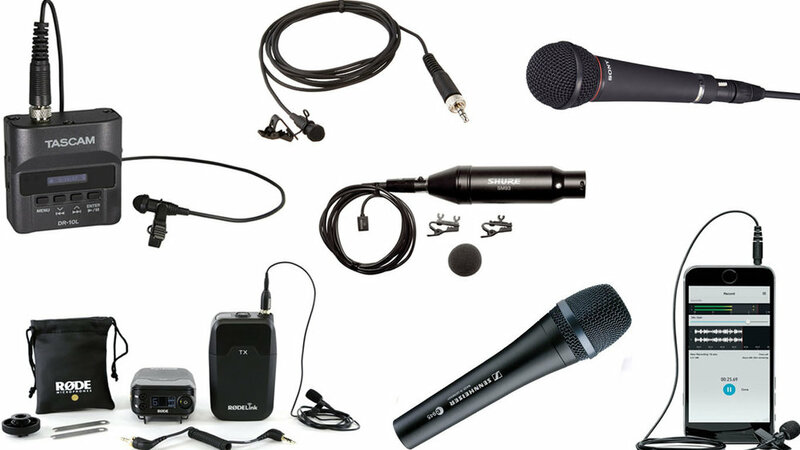 Wireless mics require a transmitter that you wear and a receiver that is connected to your camera or mobile device. Most handheld microphones have the transmitter in the base of the microphone while lavaliers will have an external transmitter that you generally wear behind your back. The quality and range of these microphones vary widely and there are new microphones coming out yearly. The most expensive is not necessarily the best for your needs. What matters the most is the range of the microphone, the clarity of the microphone and the frequency range it operates on. That last point is probably the most important today per my previous point about the wireless spectrum shrinking for microphones. Bluetooth mics are relatively new and I've honestly not had experience with them beyond your basic wearable earbuds. I can't begin to offer advice on your particular needs in this article. If you want to explore which microphone would work best for your needs and budget, I would suggest you speak to an audio professional and tell them exactly what you're trying to do. One great resource is Sweetwater Sound. Super knowledgeable and very friendly folks who truly know their entire catalogue. Be prepared to tell them what device will be your camera (smartphone model, tablet model, camera model), what your budget range is and what type of microphone you'd like to use (lavalier, handheld, shotgun, bluetooth, earbud). I reach out to Sweetwater anytime I have an audio question and they have never steered me wrong. Next time we'll talk about cameras. Good luck!